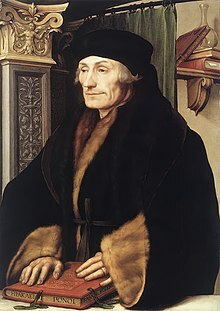 Desiderius Erasmus Roterodamus (28 October 1466 – 12 Julie 1536), kent as Erasmus or Erasmus o Rotterdam,[note 1] wis a Dutch/Netherlandish Renaissance humanist, Catholic priest, social creetic, teacher, an theologian. ↑ Erasmus wis his baptismal name, gien efter St. Erasmus o Formiae. Desiderius wis a sel-adoptit addeetional name, which he uised frae 1496. The Roterodamus wis a scholarly name meanin "frae Rotterdam", tho the Laitin genitive would be Roterdamensis. This page wis last eeditit on 30 Mairch 2017, at 22:09.